Home / Ionization / How Do ESD Air Ionizers Work? 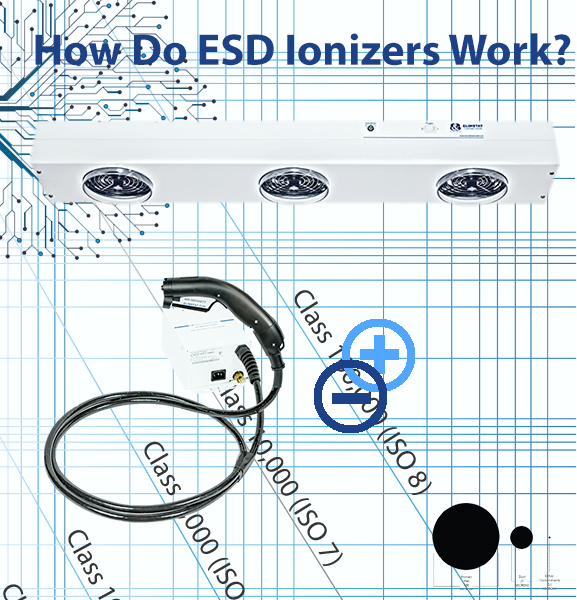 How Do ESD Air Ionizers Work? We often hear our customers say they want to “de-ionize” or “ionize” air flow to protect ungrounded electronics and work surfaces from holding a static charge. In this article, I explain how ESD air ionizers work, and summarize the ESD air ionizing guns and blowers we sell. • How Does Ionization Work? We often hear our customers say they want to “de-ionize” or “ionize” air flow to protect ungrounded electronics and work surfaces from holding a static charge. Air Ionizers are used to clean air of static charge and particulate matter. They are used on table tops, inside machines, from overhead, and as guns that are handheld. When ionized air comes into contact with particulate matter it attracts or pushes particles and static off of the object you are trying to protect from electrostatic discharge (ESD) or cross contamination from electrostatic attraction (ESA). 1. How does air become ionized? Ionizers are made up of either a single emitter point (guns) or multiple emitter points (blowers). An emitter point is a metal needle that conducts charge. When the voltage from an electrical power source is applied to an ionizer’s emitter point, it creates an electric field or “corona” around the emitter. This corona of ions then interacts with electrons in nearby gas molecules. With the use of alternating current (AC) or direct current (DC) the ionized air is pushed by the motor in the ionizer towards the surface you are aiming it at. When choosing an ionizer you will want to consider how quickly you need it to work, and how close you can place it to the target. AC Ionizers are normally preferred in automated assembly-line applications where you need to ensure charge is dissipated evenly across the surface of an object quickly. If you were to use DC ionization on an automated assembly line, “streaking” could occur: one side of an object can be reduced of its charge, and the other side of the object can be left untouched. This is because DC ionizers have emitter points spaced apart, and are forced to shoot ions in sequence to achieve the same effect as AC ionizers running at line frequency. Direct current (DC) ionizers shoot both positive and negative ions through their emitter points at constant rates. Since the ions are emitted from separate points, there is much less recombination of ions over distance– which can cause charge to accumulate in the air. In fact, some DC ionizers are used in clean rooms without using air flow at all. 3. When Should I Use Ionization? Static electricity and particulate matter contamination is a problem in a range of industries. Static electricity causes primarily two problems. The first is the discharge of electricity onto a component that zaps it. Known as ESD, electrostatic discharge can alter the functioning of electronic circuits permanently. The second problem caused by static is that a charged object can attract particulate matter onto it. Known as ESA, electrostatic attraction can cause the charged object to become contaminated and no longer usable. In fact, ionization is increasingly being used inside clean rooms as more engineers realize that air filtration alone does not ensure the elimination of particulate contamination from subvisible particles (less than 25 microns). Ionization is needed when you have insulators that hold static, and / or conductors that are not grounded. Insulators that are well known are wood, rugs, and plastic. If you cannot uninstall features of your work area that are insulative it is best to you use ionization. Since an insulator can remain charged for hours and cannot be grounded, it is best to use ionization to ensure charge is not building up. Insulators are charged by triboelectrification or rubbing against other materials where electrons are exchanged resulting in the creation of a charge. Every time you are walking across a surface that is insulative you are building up charge on yourself. Conductors that are well known are aluminum, carbon, copper, and gold. Normally conductive material is used in grounding to bring static electricity to ground. However, conductors can be isolated. This is when they are dangerous of causing ESD. A conductor that is isolated from the ground is essentially a walking or standing lightning bolt since if enough charge builds up on a conductor induction will occur- zapping people or things that are merely in proximity. For example, ionization is often used in the manufacture of plastics to dissipate the ambient charge generated in low humidity by plastic film rolling over metal production lines. The amount of charge that can build up in these situations can literally cause people to feel themselves being zapped if they are near enough the isolated conductor.